On the 31st of March and the 1st of April our Dutch dealer East West Audio Shop organized a great show with one key role player: Blumenhofer Acoustics! Set-ups were made with the Fun's 10 and 13, Big Fun 17, Genuin FS4.2, Genuin FS3.2 and Genuin FS1. Main source during this event was streaming audio, except for one set-up (and this set-up had it's private room to show the real meaning of dynamics): Blumenhofer Genuin FS1, Grandinote mono-amps, Octave Phonomodule and an Acoustic-Signature turntable with a van den Hul cartridge. All the cables were supplied by Live Cable. This set-up almost made us forget we were listening to reproduced music, closer to life is almost impossible. A very big surprise for our visitors was the set-up in the main hall with the Genuin FS3.2. 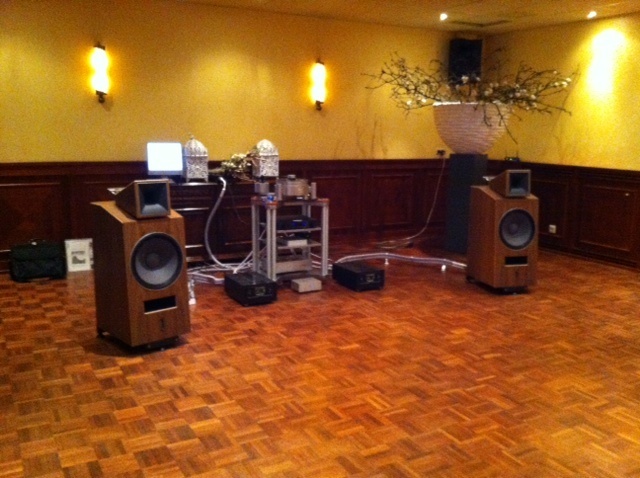 Powered by an Octave HP300 mkII and a RE 280 power amplifier this set-up was able to fill the complete hall with a very good open 3- dimensional sound with lot's of dynamics. No big surprise for us of course, but to keep in mind: this room was 10 meters wide and 20 meters long! A very big compliment for this set-up. The source in this set-up was streaming audio with Arcam and Calyx DAC's. Again we were also noticing that Blumenhofer and T+A is a very good marriage, the Genuin FS4.2 and Big Fun 17 almost seemed to be made for this electronics, according to our visitors: nothing but big thumbs up! As a ''little'' surprise we introduced the Blumenhofer Fun 10, this €975 a piece loudspeaker was playing with the all-in-one CVR-100 from Audio Block (€799), this complete set-up showed visitors that even the smallest Blumenhofer loudspeaker is still a real Blumenhofer loudspeaker. While playing in that same 200m2 room there was no lack of bass or definition at all! We foresee a very good future for this new range, almost impossible to beat in it's price range. As with every show also this one had to come to an end, but we already agreed, this is going to be an event that will return every year.